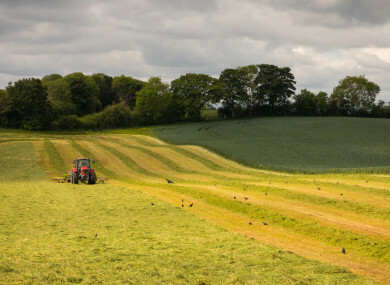 THE IRISH FARMERS Association (IFA) has called on farmers, solicitors, auctioneers and the media to essentially boycott forced sales of farms by vulture funds. Speaking in Dublin today, the association’s president Joe Healy said banks with high numbers of distressed loans have sold them on rather than trying to come to a reasonable agreement with the farmers. He said the IFA is “standing firmly behind farmers who are committed to implementing a credible solution”. His association is working, he said, to protect farms from vulture funds that “want to get their money immediately” by forcing the sale of the farm, rather than negotiating a deal that would allow the farmer to pay back their debt and keep their land. The IFA has been contacted by around 200 farmers who are impacted by this issue so far this year. Representatives believe more than 2,500 farms and 150,000 acres of Irish farmland are impacted. IFA farm business chairman Martin Stapleton told reporters that the pillar banks have shown that they are willing to engage to come up with workable solutions for farmers. However, where loans have been sold to unregulated parties, what we know as vulture funds, it is creating a huge challenge for our members and our service. It is a challenge that we must address in a more robust way. More than most sectors of the community and the economy, farmers are impacted because their level of security tends to be greater than outside of the agricultural sector and it has maintained a strong value. “This means the vulture fund sees it as possible to recover all of their money plus their costs immediately by appointing a receiver and forcing through a farm sale,” he explained. Stapleton says farm loans "barely in the category of being distressed" were bundled up with other business loans to make the loan book more attractive to vulture funds. He said vulture funds are treating farmers with “an ever-increasing aggressiveness”. Stapleton also said that said dealing with the vulture funds was like “talking to a wall” and so they are asking other farmers, business people and the community in general not to allow this activity to continue. The association also said it would continue to challenge the political system to change our laws to regulate what vulture funds can do, and to protect borrowers. Supporting this call for an effective boycott of vulture fund sales today was Sinn Féin’s Pearse Doherty and Martin Kenny, who urged people to get behind it. “We’ve seen how effective this can be in the past, we’ll be reminded of when properties were sold, homes were sold, in this city by auctioneers that because of local communities and individuals standing up they were able to get all of those sales suspended,” Doherty said. We have instances where people in the community, business people for example, won’t allow the sale of farmlands to happen within their premises. This is where people, farmers, are making reasonable responses to try to pay their loans, where they entering into negotiations and looking to come up with some solution. Martin Kenny referenced one particular incident in Carrick-on-Shannon, Co Leitrim in 2014 when Joe Dolan, owner of the Bush Hotel, prevented an auction at his hotel from going ahead. “When he realised what was going on, he stopped the sale and told them to get out of his hotel, that he depended on the community and that he needed people to stand up to the banks and that everyone that was in business was in the same position and that farmers needed to be recognised – that they had a right to try their best to get out of these situations and not to be forced into a sale like that,” Kenny said. He said he believes farmers will take heed of this campaign and will stick up for one another. At the end of the day, you know, there’s power in community, there’s power when people come together, when people work together and support each other. Email “'There's power in community': Farmers urged to boycott forced sales of farms by vulture funds”. Feedback on “'There's power in community': Farmers urged to boycott forced sales of farms by vulture funds”.